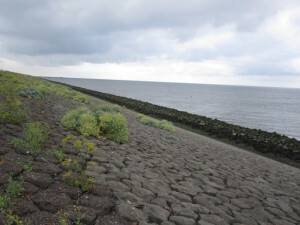 Today we crossed the Afsluitdijk – an incredible 32km long dike that dams off the Zuiderzee, a salt water inlet of the North Sea, turning it into the fresh water lake called the IJsselmeer. It was a challenge because we had a steady headwind. 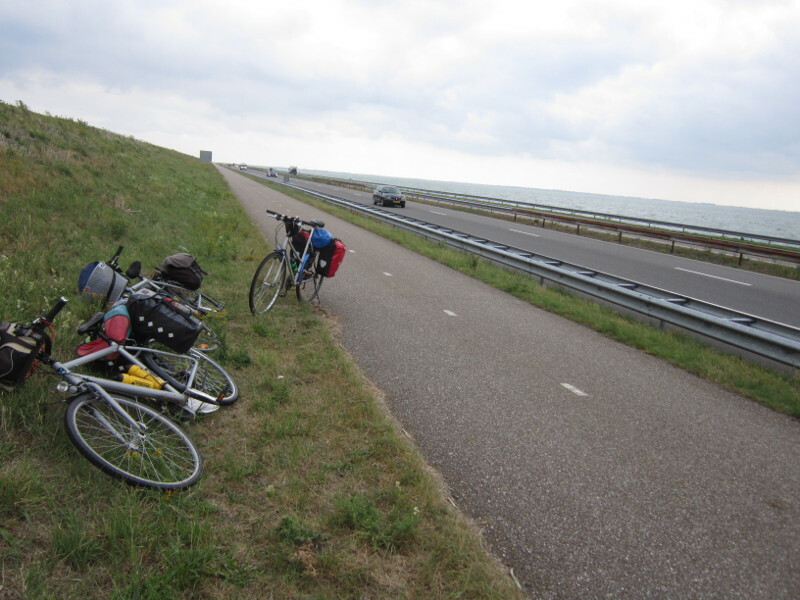 In the end it was not so bad, the cycle path was very good and we just needed to keep going. There is a monument in the middle of the dike to the engineer who designed it. 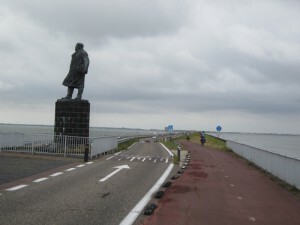 Many know him from the statue at the Monument on the Afsluitdijk: Cornelis Lely. Cornelis Lely (Amsterdam, 23 September 1854 – The Hague, 22 January 1929) was a Dutch engineer, hydraulic engineer, minister, governor and politician. He is the father of the Zuiderzee project. 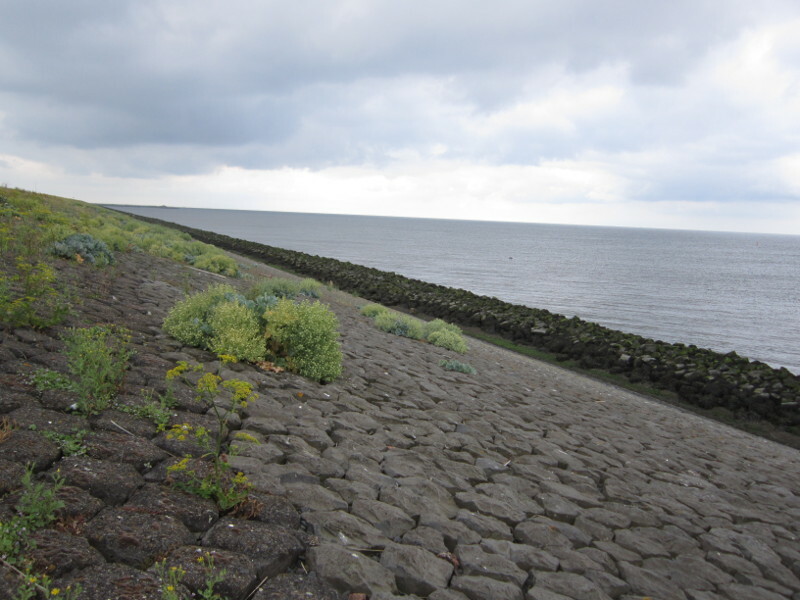 In 1891 the young engineer designed the first feasible plans for the Afsluitdijk. In 1913, when he was Minster of Public Works, he ensured that the project was placed on the cabinet’s agenda. Lely died in 1929 at the age of 74. 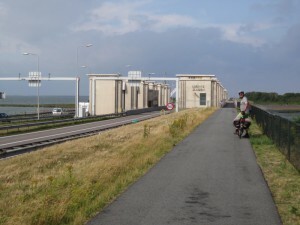 He never saw the completion of the Afsluitdijk. There was no wind for a while when we came off the dyke (maybe the calm before the storm). We passed through towns of Oosterland, Hippolytushoef and then Anna Paulowna. Here I got a flat tire again. We had just changed it when a local man stopped to warn us about a bad storm coming. We were not overly concerned, as we were not far from our final destination. However we decided to continue to Schagen, about 14km away, where we planned to do our shopping before going to our bed and breakfast. The weather did begin to change, with a wind coming up mostly behind us and some rain. 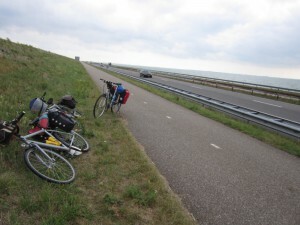 It wasn’t a problem until the storm hit us with full force around 4km out of Schagen. 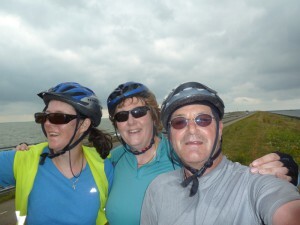 We were along a canal cycle path with no shelter. It came on very suddenly – so bad that we couldn’t ride on our bicycles and had to get off and push. Unfortunately we had to travel directly into the wind. The rain was driven into our faces, feeling like little pins. It was hard to keep our eyes open due to the water being blown into them, even with glasses on. The only thing we could do was keep walking. None of us have ever experienced weather like this while cycling before. The road changed direction for the last km into town with the wind behind us. We managed to ride in, or I should say we were blown into town. 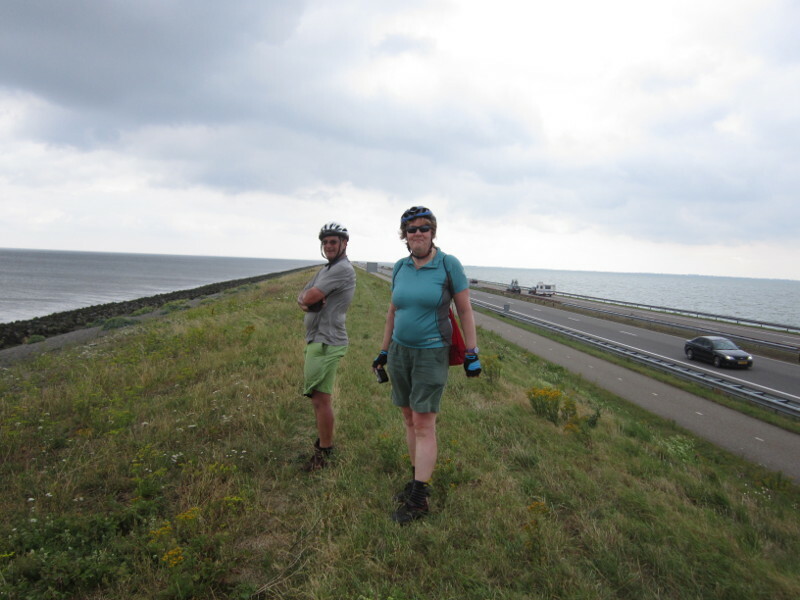 We didn’t have to pedal at all – the wind pushed us along at quite a rate. At the first intersection into the town we came upon a woman clinging to a lamp pole and crying. Kris left his bicycle and persuaded her to come to the petrol station shop with us – she wanted to go the other direction. She was unsteady on her feet and really scared of the strong wind so Kris helped her across. We were all relieved to reach the petrol station shop – which was quite warm and spacious. We were able to buy coffee and instant soup and biscuits and warm up. The staff were very good, not complaining about how we were wetting the floor. The storm outside showed no sign of letting up and it was clear that we could not travel another 8km to our bed and breakfast. So we steeled ourselves to make our way into Shagen to find accommodation. Luckily it was not far and we found rooms at the second hotel. This is the most we have paid for a room so far, but we had little choice. Our room is in a rebuilt castle. It was good to get warm and dry again. Everything was wet – water sloshing around in shoes etc. My camera was a casualty of the storm – totally dead. Luckily I could still download the photos from the memory stick. 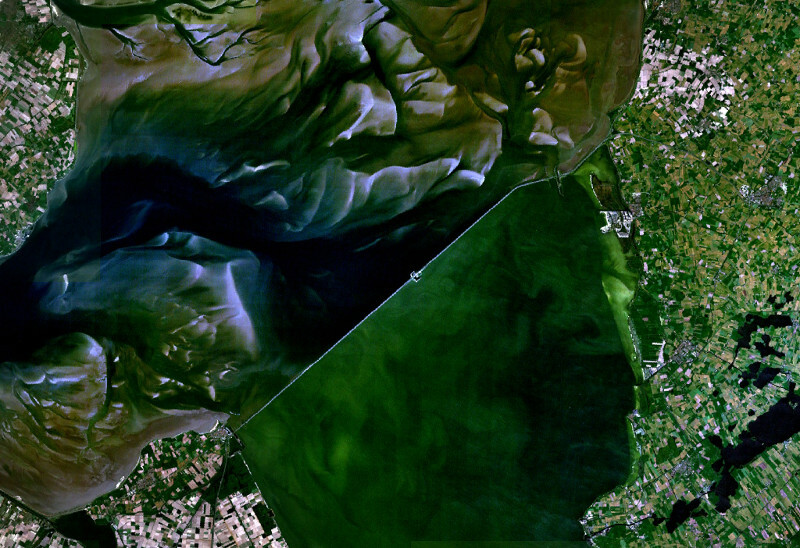 Later on we learnt that this was the most severe July storm ever recorded in the Netherlands, with winds of up to 121 km/h on the west coast. Trains stopped running in Amsterdam, many trees came down and one person was killed when a tree fell on his car. That evening we were treated by Esther to a big meal in a Kebab/Steak restaurant and some beers at a local pub. We met a cheese-maker who brought us some of his Gouda cheese to taste.